Join Daredevil, Black Widow and other heroes in protecting the city from enemies but watch out for Punisher’s lethal tendencies. Team up with the vigilantes known as the Marvel Knights on the tabletop in the latest Marvel Dice Masters Organized Play event. In the Marvel Dice Masters: Marvel Knights Organized Play, players face off in tournament play at their FLGS for the chance to win exclusive prizes. As a participating store in the program, you will need to register your store in the WizKids Event System (“WES”). If you haven’t already registered your store, please make sure you visit the WizKids Event System and click “Create New STORE Account.” If you have any questions or problems, contact Inquiries@NECAonline.com and put “WizKids Event System” in the subject line. 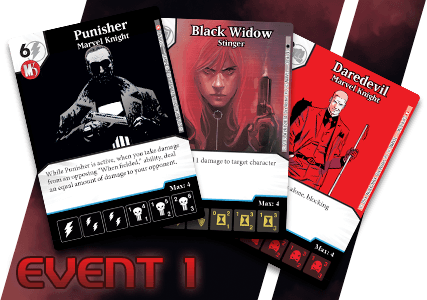 Once your store is registered in the WES, you can schedule your Marvel Dice Masters: Marvel Knights Monthly OP event using the official template in the “create an event” section of the site! Is Your Store Registered In The WizKids Event System? Check Now ! The Marvel Dice Masters: Marvel Knights Organized Play expands on the Dice Masters Organized Play event series based on the Marvel Universe. Players interested in participating can find stores and events in their area through the WizKids Event System!